Brian Cannon reports he has found the church was named St. Marys. 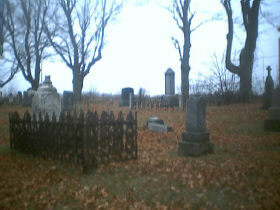 This Cemetery is located on Cemetery Road. Many of the stones have fallen and broken. When asked about the history of the cemetery it was stated that a Catholic Church stood beside the cemetery and several of the parish were dying due to the plague. It was decided to burn the church to rid it of the rats that were carrying the disease. From the dates you can see some families lost several members within days of each other. GRAVES Ella C , Born 1863 , Died May 18 186?